• Arby’s, 1619 Rombach Ave., Wilmington, Jan. 23. Follow-up. Critical: Handwashing sink in kitchen has no hot water. Water temperature is 58°F. This must be fixed immediately. (3rd Notice.) Cutting boards on prep table/cooler are dirty/stained and have cuts in the material. **All of the above violations are the 3rd Notice. All of these repairs and violations must be taken care of by the next inspection on Feb. 6, 2019. New Violations: When I arrived at the facility there were 2 employees behind the counter without hats and 4 employees without beard nets. Note: 1 employee without hat or beard net was making sandwiches. Manger provided employees with hats and beard nets. Walk-in freezer had ice build-up on floor, wall and boxes. Complaint: Received complaint regarding employee eating food, then bagging french fries with hands without changing gloves or washing hands. Addressed complaint with manager. Discussed employees washing hands and changing gloves when touching foods. Also discussed handwashing in general. Discussed that employee was eating behind the counter in the food service operation. We need to improve on handwashing and sanitation. • Barrera’s Community Meat, 230 Main St., Port William, Jan. 24. Facility was closed. Sign on door says to call for meat orders and another sign says gone for supplies with same number. Called number, mailbox full with no ability to leave message. Please call for appointment. Left copy of report in front door. • Generations Pizzeria, 100 Lowe’s Drive, Wilmington, Jan. 24. Critical: Time holding pizza and salad items on pizza bar on Sundays and Mondays with no written procedure. Please provide written documentation of time holding procedure. 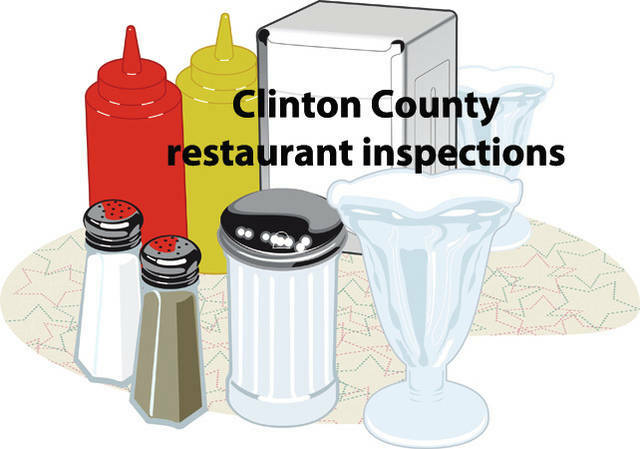 There is no one at this facility that is Class 2 food safety certified. Walls by dishwasher and prep coolers are dirty with splash. Non-working equipment (prep cooler) in facility. • 68 Shell, 5737 US 68 N, Wilmington, Jan. 23. Everything looks good! Thank you. • Bob Evans, 1075 Eastside Drive, Wilmington, Jan. 22. Follow-up. Seven previous violations corrected. Critical: Cream cheese icing on the line had a date on container of Jan. 20. Manager discarded it. Inside of microwave on prep line had food debris inside of it. Manager had unit cleaned while I was finishing my inspection. Thank you! • Elks Lodge #797, 2541 SR 22 E, Wilmington. Previous violation corrected. Sliding door cooler in the kitchen, seal is coming off around the track. No one has Class 2 license. • Frisch’s, 1341 Rombach Ave., Wilmington, Jan. 22. Follow-up. Five previous violations corrected. Thank you. Critical: Individual containers of sauces in the take-out prep cooler were dated for use by Jan. 14 and Jan. 20. Manager removed and discarded. All facial hair must be properly restrained. Grill cooks and kitchen staff have facial hair that is not restrained. Salad walk-in cooler door does not close properly. Maintenance was at facility during inspection working on the unit. Walk-in cooler door, plastic strips coming off around outside. In server station, prep cooler grill cover coming off.